The Faculty Association membership voted in favour of ratifying proposed amendments to the Association’s By-Laws. Note updated By-Laws will be available on the Association website soon. The Faculty Association membership voted in favour of withdrawing from the Confederation of Alberta Faculty Associations (CAFA). Note that under the CAFA By-Laws our membership will continue until June 30, 2019. The Faculty Association is seeking nominees to the Board of Directors. There are seven (7) vacancies open for election on the Board of Directors (five (5) three-year terms, one (1) two-year term, and one (1) one-year term). The designated sessional seat is a one-year term and is also open for election. Nominees must be current members of the Association, or have held a sessional position at some point since May 1, 2018. Note that Paul Rogers, President and Chair of the Board of Directors, is currently completing the first year of a two-year term and thus an election is not required for this position. The deadline for nominations is Friday, February 8, 2019 at 4:30 p.m. Nominations must be received at the Faculty Association office by that time. Nominations must be received in writing. Also required on the nomination form are the signatures of at least three members of the Association, as well as the written consent of the nominee. Nominations should be accompanied by a statement from the nominee of a maximum 100 words, which will be circulated along with the ballots. No member may nominate more than two candidates. Potential candidates should be aware that the Board of Directors meetings are regularly scheduled on Tuesday afternoons, approximately once per month from September to June. Additional meetings are scheduled as required. Directors are also regularly appointed to a variety of other Association, University, and external committees as representatives of the Association. Please contact the Faculty Association office for a nomination form. Over the summer, Professor Tavis Campbell (Department of Psychology, Faculty of Arts) was appointed by the Minister of Advanced Education as the Faculty Association’s nominee to the Board of Governors. The position was left vacant after Professor Peggy Patterson (Werklund School of Education) retired in June. Professor Campbell was appointed to serve the remainder of Professor Patterson’s term ending July 31, 2019. Because of his role on the Board of Governors, Professor Campbell will now sit as a non-voting member of the Association’s Board of Directors. Professor Campbell has been a member of the Association’s Board of Directors since July 1, 2011. As you prepare your taxes, remember that your Faculty Association dues (which include CAFA dues and your CAUT dues) are tax deductible. You can find these dues on your pay stub and in box 44 of your 2017 U of C T4. The Faculty Association’s audited financial statements were approved by the Board of Directors on February 6, 2018. The audit was executed as required by the Association’s bylaws. The auditors found that there was excellent cooperation between management and other personnel, and that the audit numbers support the assurance that the Association is in good financial shape. The financial statements for the fiscal year 2016-2017 are available here. If you have any questions, please contact the Association office. Therefore, all academic staff will have received an election package by campus mail which includes voting procedures, information from the candidates and a ballot. Ballots are to be returned to the Faculty Association (Education Tower 1402) no later than 4:30 p.m., Monday, March 20, 2017. Polly Knowlton Cockett (Werklund School of Education) was elected by acclamation to the designated sessional seat on the Board for a one-year term beginning July 1, 2017. The Faculty Association would like to congratulate Michael Czuba (Faculty of Arts, School of Creative and Performing Arts) and Awah Mfossi Sidjeck (Faculty of Arts, Department of Languages, Linguistics, Literatures and Cultures), recipients of this year’s Sessional Travel Grants. These grants serve to support the academic goals of sessional members of the Faculty Association by providing funding for a portion of travel costs related to making scholarly presentations, attending conferences, or other scholarly activity in their field. The purpose of this grant is to provide these members an opportunity to profile their research, remain current in their fields, and thereby benefit the University with their enhanced expertise and profile. Although the Association is pleased to be able to provide these opportunities for sessionals, it also speaks to the lack of support available for these academic staff. As you prepare your taxes, remember that your Faculty Association dues (which include CAFA dues and your CAUT dues) are tax deductible. You can find these dues on your pay stub and in box 44 of your 2016 U of C T4. The term of the President and Chair of the Board of Directors, Sandra Hoenle, is expiring on June 30, 2017. Hoenle is eligible to stand for a one-year extension of her term, and nominations of other candidates are invited. As per the Association by-laws, any member nominated for President and Chair of the Board shall have been a member who has served on the Board of Directors for at least one year during the previous five years. There are five (5) three-year terms, and one (1) two-year term open for election on the Board of Directors. The designated sessional seat, a one-year term, is also open for election. Nominees must be current members of the Association, or have held a sessional position at some point since May 1, 2016. The deadline for nominations is Wednesday, February 8, 2017 at 4:30 p.m. Nominations must be received at the Faculty Association office by that time. Click here to download a nomination form for President and Chair of the Board of Directors. Click here to download a nomination form for Board of Directors member. More information on these positions is available by contacting the Faculty Association by email, faculty.association AT tucfa.com, or by phone, (403) 220-5722. Nominations are being sought for election to the Canadian Association of University Teachers (CAUT) Executive Committee, namely: President, Vice-President, Chair of the Academic Freedom and Tenure Committee, Chair of the Contract Academic Staff Committee, Co-Chair of the Equity Committee (1), Representative-at-large (Quebec), Representative-at-large (Aboriginal), Representative-at-large (Francophone), and Two Representatives-at-large (General). The deadline for nominations is March 1, 2017. Nominations are also being sought for election to positions on four CAUT Standing Committees: Academic Freedom and Tenure Committee (three vacancies); Collective Bargaining and Economic Benefits Committee (three vacancies); Equity Committee (ten vacancies); and Librarians’ and Archivists’ Committee (four vacancies). The deadline for these nominations is February 1, 2017. Those seeking endorsement for their candidacy by the local Association Board of Directors should file their nomination forms with our office no later than January 16, 2017. For further information on any of the above positions, or for a nomination package, please contact the Faculty Association. More information on CAUT Executive Positions and Standing Committee nominations can be found online at www.caut.ca. The Faculty Association office will be closed Friday, December 23 for the holiday season and will reopen on Tuesday, January 3. The Association’s voicemail will be checked regularly on days the University is open. Have a safe and happy holiday! The Faculty Association’s audited financial statements were approved by the Board of Directors on February 9, 2016. The audit was executed as required by the Association’s by-laws. The auditors found that there was excellent cooperation between management and other personnel, and that the audit numbers support the assurance that the Association is in good financial shape. The financial statements for the fiscal year 2014-2015 are available here. If you have any questions, please contact the Association office. The Faculty Association is actively seeking nominees to the Board of Directors. The term of the President and Chair of the Board of Directors, Sandra Hoenle, is expiring on June 30, 2016. Hoenle is eligible to stand for a one-year extension of her term, and nominations of other candidates are invited. As per the Association by-laws, any member nominated for President and Chair of the Board shall have been a member who has served on the Board of Directors for at least one year during the previous five years. There are five (5) three-year terms open for election on the Board of Directors. The designated sessional seat, a one-year term, is also open for election. Nominees must be current members of the Association, or have held a sessional position at some point since May 1, 2015. The deadline for nominations is Monday, February 8, 2016 at 4:30 p.m. Nominations must be received at the Faculty Association office by that time. More information on these positions is available by contacting the Faculty Association by email, faculty.association@tucfa.com, or by phone, (403) 220-5722. Nominations are being actively sought for election to the Canadian Association of University Teachers (CAUT) Executive Committee, namely: President, Vice-President, Treasurer, Chair of the Collective Bargaining and Economic Benefits Committee, Chair of the Librarians’ and Archivists’ Committee, Co-Chair of the Equity Committee (1), Representative-at-Large (Aboriginal), Representative-at-Large (Francophone), Representative-at-Large (Quebec) and two Representatives-at-Large (General). The deadline for nominations is March 1, 2016. Nominations are also being sought for election to positions on four CAUT Standing Committees: Academic Freedom and Tenure Committee (two vacancies); Collective Bargaining and Economic Benefits Committee (two or three vacancies, dependent on whether an incumbent member of the committee is elected Chair by CAUT Council); Contract Academic Staff Committee (two vacancies); Equity Committee (up to one vacancy, dependent on whether an incumbent member of the committee is elected Chair by CAUT Council); and Librarians’ and Archivists’ Committee (one or two vacancies, dependent on whether an incumbent member of the committee is elected Chair by CAUT Council). The deadline for these nominations is February 1, 2016. Those seeking endorsement for their candidacy by the local Association Board of Directors should file their nomination forms with our office no later than January 20, 2016. For further information on any of the above positions, or for a nomination package, please contact the Faculty Association. The Faculty Association office will be closed the afternoon of Friday, December 18 for the holiday season and will reopen on January 4. The Association’s voicemail will be checked regularly on days the University is open. Have a safe and happy holiday! Georgette Paré (Drama) has also been re-elected by acclamation as the Sessional member of the Board of Directors for a one-year term beginning July 1, 2013, as per the Association’s by-laws. The Association would also like to announce the resignation of Professor Ki-Young Lee (Cell Biology and Anatomy) from the Board of Directors. We would like to thank Professor Lee for his willingness to serve the Association. As you prepare your taxes, remember that your Faculty Association dues (which include CAFA dues and your CAUT dues) are tax deductible. You can find these dues on your pay stub and in box 44 of your 2012 U of C T4. Each newsletter we hope to provide you with a snapshot of the Faculty Association membership. Included in this issue is a look at the gender of ongoing academic staff by Faculty for the winter term 2012. Click on the chart below to enlarge or for a .pdf click here. The term of the President and Chair of the Board of Directors, Paul Rogers, is expiring on June 30, 2013. Rogers is eligible to stand for a one-year extension of his term, and nominations of other candidates are invited. There are five (5) three-year terms open for election on the Board of Directors. The designated sessional seat, a one-year term, is also open for election. Nominees must be current members of the Association, or have held a sessional position at some point since May 1, 2012. The deadline for nominations is Friday, February 8, 2013 at 4:30 p.m. Nominations must be received at the Faculty Association office by that time. Nominations are being actively sought for election to the CAUT Executive Committee, namely: President, Vice-President, Chair of the Academic Freedom and Tenure Committee, Chair of the Contract Academic Staff Committee, Co-Chairs (2) of the Equity and Diversity Council, Member at Large (Quebec), Member at Large (Aboriginal), Member at Large (Francophones) and two general Members-at-Large. The deadline for nominations is March 1, 2013. Those seeking endorsement for their candidacy by the local Association Board of Directors should file their nomination forms with our office no later than January 18, 2013. For further information on any of the above positions, or for a nomination package, please contact the Faculty Association. More information on CAUT Executive positions can be found on the CAUT website here. The Faculty Association office will be closed at noon on December 20th for the holiday season and will reopen on January 7th. The Association’s voicemail and email will be checked regularly on days the University is open. The Faculty Association office has now moved to its temporary location in the Math Sciences Building, Room 220. We appreciate your patience during our relocation. The Faculty Association can continue to be reached at 403.220.5722 or by email at faculty.association@tucfa.com. When an academic staff member contacts the Faculty Association office, they will reach a Faculty Association staff member who will treat the call with the utmost confidentiality. Faculty Association staff are not employees of the University of Calgary. Each newsletter we hope to provide you with a snapshot of the Faculty Association membership. 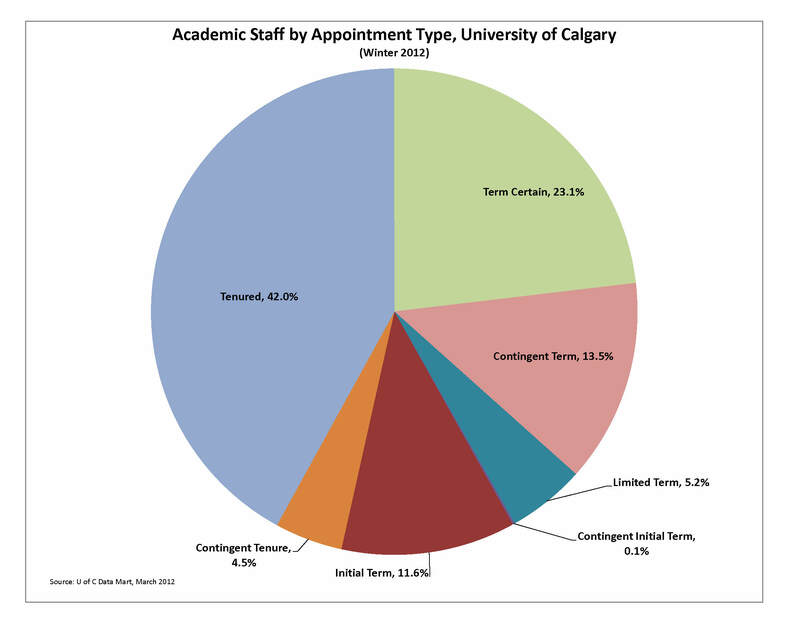 Included in this issue is a look at academic staff by appointment type for the winter term 2012. Click on the chart below to enlarge or for a .pdf click here. Each newsletter we hope to provide you with a snapshot of the Faculty Association membership. Included in this issue is a look at the age of ongoing academic staff (excludes sessional members) for the winter term 2012. Click on the chart below to enlarge or for a .pdf click here. The Board of Directors would like to welcome Professor Cynthia Simmons from the Haskayne School of Business. Professor Simmons has been appointed for a one-year pro-tem position ending June 30, 2013. For a full list of Board of Directors members click here. All academic staff will receive the negotiated across-the-board increase of two per cent to their base salaries beginning July 1, 2012. Also merit increases will also be applied on July 1, 2012. These merit increases will be the same amount that was received by ongoing academic staff members retroactive to July 1, 2011. A minor change in CAUT dues will take effect on July 1, 2012. These dues are calculated by applying a mil rate to the national average salary at each rank. While the mil rate remains unchanged at 1.50, variations in the national average salary result in slight changes to the dues amounts. The Election Committee hereby declares that the ongoing membership has rejected the offer from the Board of Governors regarding the one-time voluntary retirement incentive. Click here for information on ratification interference. 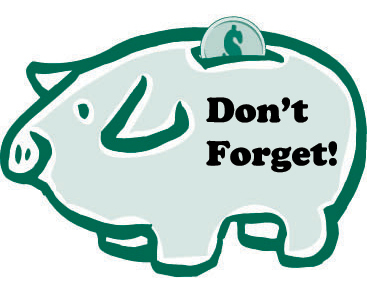 As you prepare your taxes, remember that your TUCFA dues (which include CAFA dues) and your CAUT dues are tax deductible. You can find these dues on your pay stub and in box 44 of your 2011 U of C T4. There are five (5) three-year terms, one (1) two-year term and one (1) one-year term open for election on the Board of Directors. The designated sessional seat, a one-year term, is also open for election. Nominees must be current members of the Association, or have held a sessional position at some point since May 1, 2011. The deadline for nominations is Wednesday, February 8, 2012 at 4:30 p.m. Nominations must be received at the Faculty Association office by that time. Click here to download a nomination form. More information on these positions is available by contacting the Faculty Association by email, faculty.association@tucfa.com, or by phone, (403) 220-5722. Nominations are now being sought for election to the CAUT Executive Committee, namely: President, Vice-President, Treasurer, Chair of the Collective Bargaining and Economic Benefits Committee, Chair of the Librarians’ Committee, Member at Large representing Aboriginal Academic Staff, Member at Large representing Francophones and General Members-at-Large (2 positions). The deadline for nominations is March 1, 2012. Nominations are also being sought for election to positions on three CAUT Standing Committees: Academic Freedom and Tenure Committee (two vacancies, dependent on whether an incumbent member of the committee is elected Chair); Collective Bargaining and Economic Benefits Committee (two or three vacancies dependent on whether an incumbent member of the committee is elected Chair); Librarians’ Committee (one or two vacancies dependent on whether an incumbent member of the committee is elected Chair). The deadline for these nominations is February 1, 2012. Those seeking endorsement for their candidacy by the local Association Board of Directors should file their nomination forms with our office no later than January 18, 2012. For further information on any of the above positions, or for a nomination package, please contact the Faculty Association. President Paul Rogers would like to welcome Professor Janice Kinch to the Faculty Association’s Board of Directors. Professor Kinch, an academic staff member from the Faculty of Nursing, has been appointed to the Board for a one-year pro-tem term ending June 30, 2012. The Faculty Association office will be closed at noon on December 16 for the holiday season and will reopen on January 3. The Association’s voicemail will be checked regularly on days the University is open. A suspension of the increased workload for Instructors in the Faculty of Arts. The Association also saw some movement on the issue of workload and a joint Association/Board of Governors committee will be struck to look further at this issue. In addition, the Association approved a Memorandum of Agreement, as part of this ratification, that the grievance and decision to increase the workload for Instructors in the Faculty of Arts will be put on hold for a year while the administration tries to sort out what a proper process and decision would be. This stems from the Dean of the Faculty of Arts unilateral decision to increase the number of courses for Instructors (who have limited research expectations as compared to Professors) in the Faculty from six courses to eight courses starting in the 2011‐12 academic year. The increase was done without consultation and, in the Association’s opinion, without understanding what was involved in teaching courses in all of the areas of Arts. As noted, with this ratification the workload increases will be suspended. The Association will be invited to make submissions regarding the “Assignment of Duties” prior to the completion of the review. If the Association is unhappy with the result, it can grieve and also open bargaining early. A minor change in CAUT dues took effect on July 1, 2011. These dues are calculated by applying a mil rate to the national average salary at each rank. While the mil rate remains unchanged at 1.50, variations in the national average salary result in slight changes to the dues amounts.